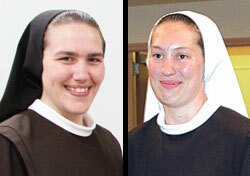 Sr. M. Madeleine Schumacker, O.S.F., left, and Sr. Maria Kolbe Elstro, O.S.F. Click for a larger version. On Aug. 9, two women who were previously members of parishes in the archdiocese professed temporary vows or renewed temporary vows as members of the Sisters of St. Francis of Perpetual Adoration at the order’s motherhouse in Mishawaka, Ind. Franciscan Sister Maria Kolbe Elstro, previously a member of St. Andrew Parish in Richmond, a part of the Richmond Catholic Community, professed temporary vows of poverty, chastity and obedience for a period of three years. A graduate of Marian University in Indianapolis, Sister Maria Kolbe will begin her ministry at Franciscan St. Anthony Health in Michigan City, Ind., a part of the healthcare apostolate of her community. On the same day, Franciscan Sister M. Madeleine Schumacker, previously a member of St. Louis Parish in Batesville, renewed her temporary vows of poverty, chastity and obedience.